The Nominee was admitted to the Bar in 1982. According to the CV, the Nominee’s court experience is limited to two years spent as Resident Magistrate, though the exact period is not specified in the CV. Thereafter the Nominee spent six years as a Senior Legal Officer in the employ of Development Bank of Zambia and Lima Bank and the Nominee’s responsibilities were limited to drafting loan agreements and security documents. Thereafter the Nominee has taught law for the past 26 years. There is also no evidence of the Nominee having any experience in constitutional law or human rights law. The Nominee has never practiced law. There is no basis for appointing the Nominee to the Constitutional Court. LADY JUSTICE HILDAH CHIBOMBA – PRESIDENT OF THE CONSTITUTIONAL COURT According to the CV, the Nominee was admitted to the Bar in 1982. For a period of four years (1982-­1986), the Nominee served as a Resident Magistrate at Kitwe and Lusaka. Between 1986 and 1989, the Nominee served as a Senior Resident Magistrate. The Nominee’s only stint as a legal practitioner started when the Nominee joined the Ministry of Justice and this was only for a period of four years. Between 1989 and 1990, the Nominee served as Assistant Senior State Advocate, in Civil Litigation. Between 1990 and 1993, the Nominee rose to the position of and served as Senior State Advocate. This marked the end of the Nominee’s career as a legal practitioner. Perusal of the Zambia Law Reports for the period revealed no case that was prosecuted or defended by the Nominee. Thereafter, for a period of four years from 1993 to 1997, the Nominee assumed the position of Principal State Advocate in charge of International Law and Agreements Department, in the Ministry of Justice, which position did not include court work. The Nominee joined the Judiciary as a Judge of the High Court on 1st October 1997 and in 2009, the Nominee was appointed Judge of the Supreme Court. The Nominee only practiced law for a period of four years, which is far less than the fifteen year period stipulated in Article 141 of the Constitution. There is equally nothing in the Nominee’s CV, which shows that the Nominee has specialized training or experience in human rights law or constitutional law. Similarly, there is nothing in the Nominee’s CV, which shows that during the time the Nominee practiced law, the Nominee dealt with any case, which arose in the area of constitutional law or human rights. The Nominee does not qualify for appointment as President or Judge of the Constitutional Court. AMBASSADOR PALAN MULONDA The Nominee was admitted to the Bar in 1995, and joined the Ministry of Justice in 1996, where he served as Assistant Senior State Advocate involved in Civil Litigation and International Legal Agreements until 2000. Between 2000 and 2003, the Nominee served a Deputy Director responsible for Human Rights and Treaties in the Attorney General’s Chambers. According to the Nominee’s CV, the Nominee IS SAID TO HAVE BEEN A PARTNER IN THE LAW FIRM CALLED PALA N & GEORGE BETWEEN 2003 AND 2006. Thereafter the Nominee joined the School of Law of the University of Zambia where he is said to have lectured and tutored in Constitutional Law and Administrative Law. Between 2009 and 2012, the Nominee served as Director of the Zambia Institute of Advanced Legal Education (ZIALE). 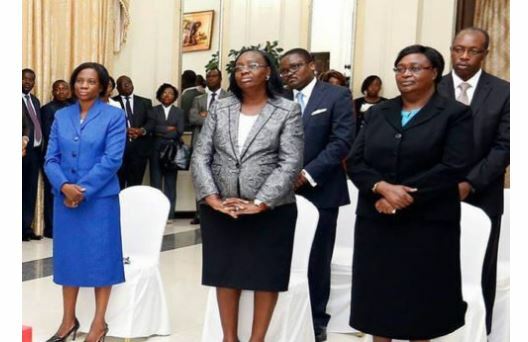 The Nominee has been Zambia’s Ambassador to the United States since 2012. The Nominee does not mention any case that he has prosecuted in the area of constitutional law or human rights law whilst at the Attorney General’s Chambers or while he served as a Partner in the firm of Palan & George. The Nominee lacks both the requisite number of years as a legal practitioner as well as experience in constitutional law and human rights law matter.